19 September 2008, at 8:34a.m. US - The North Carolina Poultry Federation recently held its 41st Annual Membership Banquet and Awards Presentation at the Grandover Resort & Conference Center in Greensboro on 7 August, with over 170 in attendance. President David Anderson called the business meeting to order where the new 2008-09 Board of Directors were elected. They include David Anderson, Butterball; Scott Braswell, Braswell Foods; Kendall Casey, Perdue Farms-Rockingham; Tommy Furlough, Cal-Maine; Charles Glass, Tyson-Monroe; Alice Johnson, Butterball; Bob Johnson, House of Raeford; Cowan Johnson, Nash Johnson & Sons; Jerry Jouhson, Butterball; Terry Maness, Perdue Farms; Darryl Moore, NC Breeder Hatchery Association; Paul Nordin, Wayne Farms; Connie Ozment, Carolins By-Products; Walter Pelletier, Goldsboro Milling Co.; Dan Peugh, Allens Hatchery;Tommy Porter, Porter Farmsl; Scott Prestage, Prestage Farms; Charles Rigdon, Case Farms; Sam Robertson, Case Farms; Richard Simpson, Simpson Eggs; Ralph Upton, Pilgrim’s Pride -Sanford; Kimber Ward, Mountaire Farms; Sam Whittington, Tyson Farms-Wilkesboro; Richard Williams, Townsends; Adam Willis, Pilgrim’s Pride- Marshville; Debbie Worley, Worley Farms; Rocky Abell, Carolina Feed Industry Association. 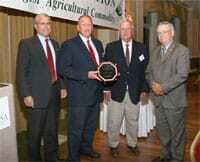 The Allied Industry Award was presented to Milton who works for Aviagen, a primary broiler breeder company. Mr Hancock, a native of Arkansas, has been directly involved in the poultry industry for over 40 years. He currently lives in Statesville and covers Georgia, Tennessee, Kentucky and parts of North Carolina. Jerry Johnson, Director of purchasing for Butterball, LLC in Mt. Olive, NC took home the prestigious Distinguished Service Award. Mr Johnson has chaired NCPF’s Membership-Sponsorship Committee for the past several years and has been associated with the poultry industry since 1969 where he began his career in the Shenandoah Valley of Virginia and later moved to North Carolina to work for Carolina Turkeys. He’s been in NC the past 21 years. Our Annual Environmental Grower awards were presented to three outstanding farm families this year. The winners are selected based on their environmental stewardship management practices as well as other agricultural related activities on and off the farm. Farm aesthetics and good neighbor relations are also very important criteria along with any new innovative ideas applied to their farm and nutrient management plan, including wildlife management. Chilton Farms, Ararat, NC took away the top award winning $1,000. Mr. M.H. Chilton and his son Chad manage six breeder houses for Tyson Farms-Wilkesboro with 60,000 capacity. They farm over 1,000 acres, with several hundred brood cows. Their farm has been in continuous operation going back several generations of Chiltons. The next two finalists were awarded $500 each for their environmental excellence. Terrace Farms in Lexington, NC, owned and operated by Jim and Linda Davis run a four-house pullet operation with Pilgrim’s Pride -Marshville. Total capacity is 104,000 pullets per year. They also farm 114 acres with 60 head of brood cows. The Davis family are third generation owners of what was once a large champion Guernsey dairy farm. 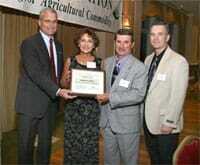 Other awards include 2005 “Davidson County Farm Family” award and Pilgrim’s 2007 “Environmental Excellence Award”. John and Rachel Etchison raise 130,000 organic broilers each year for Townsends on their Siler City farm. They have been farming 250 acres in Chatham county since 1987 and also maintain a 50-head brood cow operation. 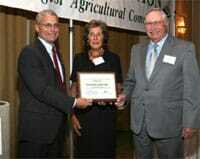 John is past chairman of Chatham County’s Soil & Water Conservation District where he has served for the past 35 years. Jan Kelly, Executive Director North Carolina Egg Association, presented the Golden Skillet award to Dr. Brian Shelton, recently retired Director of NCSUCALS Poultry Science Extension. This is the Egg Council’s top award each year to honour those who have gone beyond the call of duty to help support the NC egg industry. Officers of the Executive Board who will help lead the NCPF next year include: Charles Glass, President; Walter Pelletier, first vice-president; Kendall Casey, second vice-president; Paul Nordin, Secretary-Treasurer and David Anderson, immediate Past President.